The lowdown: John Michael McDonagh and Brendan Gleeson follow acerbic off-kilter thriller The Guard with an even darker look at contemporary Ireland. Gleeson is Father James, targeted for murder by one of his parishioners who suffered years of sexual abuse from a now dead priest. Ferociously good writing and performances, topical barbs, a large dose of James Joyce and leavening Father Ted-style irreverence make Calvary a powerful, compassionate and unforgettable film. 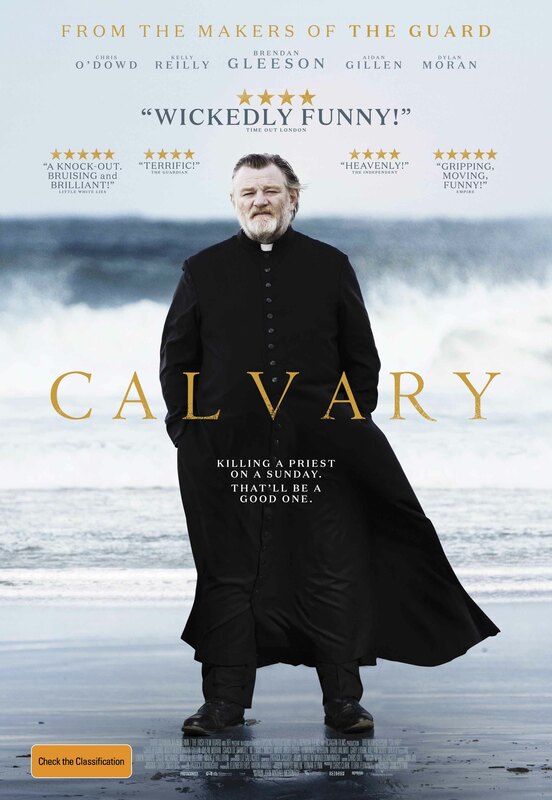 The full verdict: Calvary opens with a confessional scene in which one of Father James’ flock recounts horrific abuse by his childhood priest that encapsulates the film’s brilliance. Unflinching and shocking, but also funny and humane, it’s flawlessly handled by writer/director McDonagh, who never takes a misstep throughout. Ireland’s recent ignoble past – brought to near economic collapse by rapacious financiers not held to account by a Catholic Church with guilt and gold enough of their own – is the backdrop for the story of a man battling to do good in the face of indifference or hostility from his small town community. In this Gleeson is astonishing as a one-time drinker and fighter turned man of the cloth after his wife’s death. Large-framed, but with intelligence and integrity in how he acts with everyone from frustrated teenagers to convicted murderers, his Father James is a fascinating creation. Given seven days to “put your house in order” before the mystery parishioner exacts murderous revenge, James attempts a reconciliation with his suicidal daughter Fiona (Reilly), their tender scenes together an antidote to the venom the priest receives from every corner of society. An atheistic doctor (Gillen), a dismissive butcher (O’Dowd), a bitter publican (Stuart) and an acidic banker (Moran) sneer contempt at James’ position as an authority on virtue and morality. Despite the fact that the man clearly has the moral fibre to bring good into the community, a fact begrudgingly acknowledged by his sole friend, a curmudgeonly American writer (Emmet Walsh). As with The Guard McDonagh provides his talented cast meaty dialogue to chew on. Be it O’Dowd, sarcastically wondering if his wife’s infidelity is due to being bi-polar or lactose intolerance after he’s knocked her about, or Gillen, telling a story that will haunt the mind for days after, the supporting cast are note-pefect. And like The Guard, Calvary also carries the spirt of the Hollywood Western in its bones, Father James’ attempts to rally the town and agonising over whether to face his gunman echoing High Noon. But despite the knowing dialogue, McDonagh is too committed to the spiritual conundrum his central character faces to embrace the meta-cleverness that got his brother Martin a critical kicking from some quarters for Seven Psychopaths. The climax is shattering but full earned, set against County Sligo’s breathtaking scenery that suggests this is God’s own country, good or bad. A selection of cast interviews, but nothing from writer/director John Michael McDonagh. A commentary track from McDonagh and Gleeson would have been a gift from above indeed.